Roger Federer has learned not to take anything for granted. That's why he said what he did during the trophy presentation after his record-breaking eighth Wimbledon championship: "I hope this wasn't my last match. And I hope I can come back next year and try to defend the title." Roger Federer has learned not to take anything for granted. That's why he said what he did during the trophy presentation after his record-breaking eighth Wimbledon championship: "I hope this wasn't my last match. And I hope I can come back next year and try to defend the title." Hardly. What he meant, Federer explained Monday, was simply: "I can't think too far ahead." "I didn't think about what I was going to say. It just came out that way, to show the people that, yes, of course I hope to defend my title and, of course, I wish to be back here next year. But we just don't know if it's really going to actually happen," he said in an interview with The Associated Press at the All England Club the morning after beating Marin Cilic 6-3, 6-1, 6-4 in the final. "We have to wait and see." He didn't always take that approach, back when he was in his 20s and reached a record 10 Grand Slam finals in a row. "At 25, when you win, you're like, 'All right, I'll see you next year!' because it's normal. You're going to be playing, for sure. The body's going to be fine, most likely. And if not next year, well, then the year after that, you know?" Federer said as he walked through the hallways of Centre Court in grey pants and a white zippered warmup jacket. "But I can't really think two years ahead now. Let's be honest." 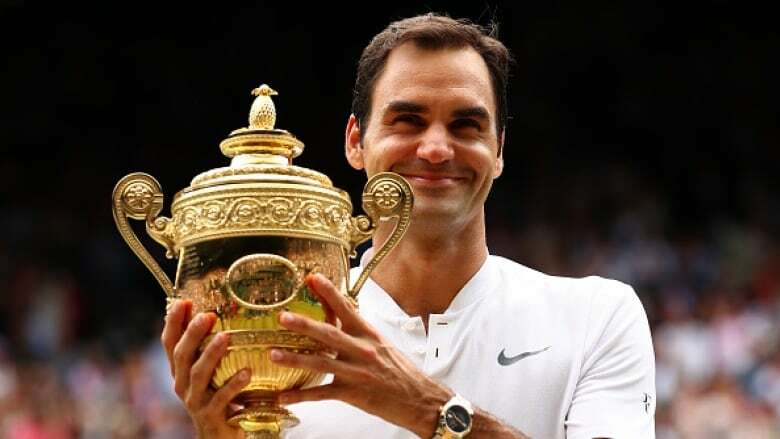 First of all, there's the no-way-around-it matter of his age: Federer turns 36 on Aug. 8; he is the oldest man to win Wimbledon in the Open era, which began in 1968. And then there's what happened about 18 months ago: A father of four, he was preparing a bath for his twin daughters when he turned and felt a "click" in his left knee. In February 2016, he had the first operation of his career, arthroscopic surgery to repair torn cartilage. "I've seen how quickly things can change," Federer said. "Filling a bathtub for my girls changed the whole next 1 1/2 years of my tennis life, really." Federer is 31-2 with a tour-leading five titles in 2017. That includes his 18th Grand Slam trophy at the Australian Open — ending a 4 ½-year drought without a major title — followed by his 19th at Wimbledon, where he became the first man since Bjorn Borg in 1976 to win the tournament without dropping a set. "Everything he does is exceptional," said Jonas Bjorkman, Cilic's coach. "Obviously, he's unique in many ways." He says he certainly didn't expect to win both majors he's entered (he sat out the French Open again, using another break during the clay-court circuit to recharge before the brief grass portion of the season). "I have a hard time thinking I could win three Slams in one year. It just sounds totally surreal to me," said Federer, who did collect trios of major titles in 2004, 2006 and 2007. "But I'll prepare myself the best way possible, so that I will have the best chance to really excel there in New York." His voice sounded deeper than usual, a bit of after-effect from celebrations into the wee hours that included the Wimbledon champions' dinner and drinks with a group of more than 30 friends at a bar. Federer said he didn't get to sleep until 5 a.m. Here he was, about 6 ½ hours later, returning to the arena to pose for group photos with 200 members of the tournament's staff — groundskeepers and others who sat in a corner of the stands while he took a spot on a courtside ledge, Wimbledon's gold trophy beside him. "Everybody say, 'Swiss cheese!"' Federer said, drawing laughter. Then he posed on the court for a few last pictures, steps from a small green sign with white letters instructing, "Keep off the grass." So, yes, expect him back on that turf in 2018. Just remember not to take his excellence for granted. He won't.